Maj Betz Inspiring the TEDx Crowd on How To Graduate College Debt-Free! My recent 7-min TEDx talk, “How to Graduate College Debt-Free” is really going to help 7th graders through college sophomores avoid the debt that plagues so many families. Take a few minutes to check it out by clicking here or the picture above, after you read this post. Then click one of the social media buttons on this post to share it if you believe you have friends and family who will need to pay for college over the next 5-6 years! They will thank you! I do too! Great audio-book that can help avoid college debt! The talk removes the excuses from parents and students not knowing that there is a boatload of money out there for college. Are you looking to fund your student’s college expense without spending your own savings? 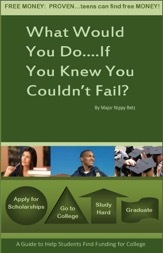 My audio-book “What Would You Do, If You Knew You Couldn’t Fail” helps start you on the journey to funding your student’s education. It makes for a perfect gift for a 7th grader thru college sophomore and their parents. Click here or the book cover to learn more and begin a journey with Major Betz learning how to get college paid for! Or just click here to listen to a 1-min excerpt from the book! For over 12 years, I have helped teens earn over $40,000,000 in scholarships, and in that time, I’ve learned one thing. There is no shortage of scholarships, there never has been, there never will be! There’s only a lack of knowledge on how to acquire them! After you watch the video, read this blog, AND register on my site (www.majorbetz.com), you will be able to help me spread the word to others who don’t want to graduate with college debt. Your race, socio-economic level, and other factors will no longer be a roadblock to earning money for college. We have a new series of short e-books coming out over the next 3 months entitled “How to Graduate College Debt-Free.” Together, the books will train an army of students how to save their families from spending all their hard-earned money on college! In Louisiana, I go fishing a lot with my dad and Uncle Gilbert. It amazes me that we fish in the same water as other anglers who catch nothing, and we still slay them! You have to know the hot fishing spots, what bait to use, the pending weather pattern, the right equipment to use, past successes of others, etc. Yet there are proven ways to succeed or fail! But to succeed, you have to put in the same effort. When we go out in my dad’s boat, we often slay the fish as we sometimes catch 80, 200, and even 300 fish. However, there are times we catch nothing, but we live to fight another day because we know there are fish out there. If only students took that same approach to scholarship search! If you put your line in the water only 10, 20, or 30 times, that will not yield the catch you desire unless you are in a “hot fishing spot”! If you look at casting your line into the water as applying for scholarships, you will be able to understand this analogy better. Unfortunately, many students apply for only 10, 20, or 30 scholarships and “hope” they applied for enough! As I often say, hope isn’t a good success strategy! Truth be told, even some of my clients apply for 20 to 40 scholarships and just stop! That’s like casting your line into the water 20 to 40 times in the first hour of fishing and then sitting in your boat with your line out of the water for the rest of the fishing trip. I promise, if you don’t put the line in the water you will not catch any fish! The same goes for searching for scholarships! If you don’t apply for a minimum of 100 scholarships, you aren’t taking the scholarship search seriously. Too many of my clients start getting cocky when they complete 20 to 40 scholarship applications. They don’t realize that is just scraping the surface of what they should be doing if they are truly serious about the scholarship search process. However, they need to understand that, in fishing, there is no magic pole either! You gotta know some of the fishing rules and navigate different scholarship channels. 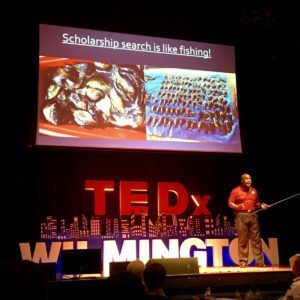 The same strategies that apply to fishing also apply to the scholarship process. Look at the many online scholarship websites as your scholarship “fishing” channels! I often have to remind my clients that I can teach them how to earn scholarships and graduate debt-free, but they have to execute, do the work, and then hope it was enough to win the money they desire! Teens and parents have to realize the process is simple, but the execution is tough due to distractions they will encounter along the way. To graduate debt-free, they first need to know the rules. What rules? I’m glad you asked! But this post is already too long, so check out the video then register on my website to ensure you get get the rest of this and future blog postings, as well as periodic scholarship tips and techniques! If you enjoyed the TEDx video or this blog, keep working with me to help your student. Get a copy of our audio-book today (just click here or on the book cover image) and start your student on an adventure to earn some of that free non-taxable money that’s available out there! Or just click here to listen to a 1-min excerpt! As I said at the beginning of this post, invest seven minutes to possibly change your student’s financial future; watch my TEDx talk below, and then share it with classes, churches, youth groups, teens, and parents all over America! The video can be viewed “and liked on YouTube” by clicking this link: https://www.youtube.com/watch?v=zXzjLM-P2Os. If you relate and find this audio-book and/or the free video helpful, please write a review and then share the TEDx video with a friend so it can be a blessing to others! 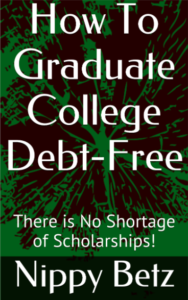 We are currently writing and video-taping 150+ other topics under the “How to Graduate Debt-Free” umbrella, so make sure you are on our email distro list so you can get your hands on future copies! Our New Series Helping Your Students Avoid College Debt! Invest in your student today by joining one of our many scholarship programs or purchasing one of our life-changing products. Our membership/book club or our 1-on-1 coaching program will give your student complete access to the entire set of “How to Graduate College Debt-Free” rules! This blog came out of the short e-book to the left. Click here to read the forewords on any of our Amazon books. We will eventually have 100+ books written by Major Betz that you can find on Amazon simply by searching “nippy betz books“. A parent and student who reads the entire “How To Graduate College Debt-Free” collection will be that much closer to doing just that; graduating college debt-free! I hope to see you at a live Scholarship Bootcamp or on one of my upcoming online events found at https://majorbetz.com/sli-events/. Invite me to speak in your city, at your church, school, business, etc. Enjoy the TEDx talk below!